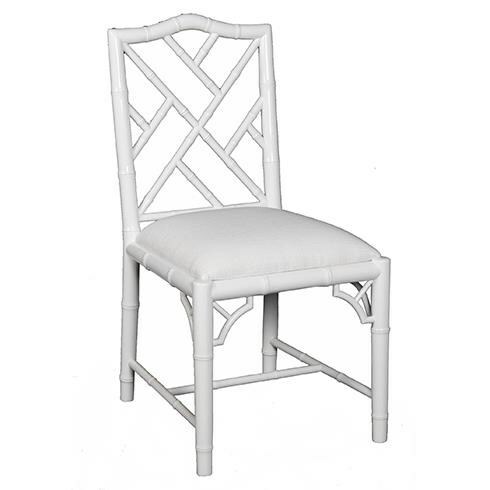 Add the Britton Dining Side Chair to your formal or casual dining set for a modern take on the classic Chippendale design. Made from solid mahogany, the dining chair's back features lattice detailing to pull together the contemporary, yet tropical style. For added comfort, this chair has fabric upholstery in Ice that creates a clean, polished look. The David Ross Britton Dining Side Chair by Selamat Designs at C. S. Wo & Sons Hawaii in the Hawaii, Honolulu, Oahu, Hawaiian Islands, Waikiki, Diamond Head, East Honolulu area. Product availability may vary. Contact us for the most current availability on this product. Featuring hand crafted frames from plantation grown mahogany, this collection adds a contemporary and tropical feel to your home. This collection includes polished brass detailing, lattice backs, and upholstered seating to emulate a sophisticated, tropical style in your dining or living rooms. The David Ross collection is a great option if you are looking for Tropical Coastal furniture in the Hawaii, Honolulu, Oahu, Hawaiian Islands, Waikiki, Diamond Head, East Honolulu area. Browse other items in the David Ross collection from C. S. Wo & Sons Hawaii in the Hawaii, Honolulu, Oahu, Hawaiian Islands, Waikiki, Diamond Head, East Honolulu area.